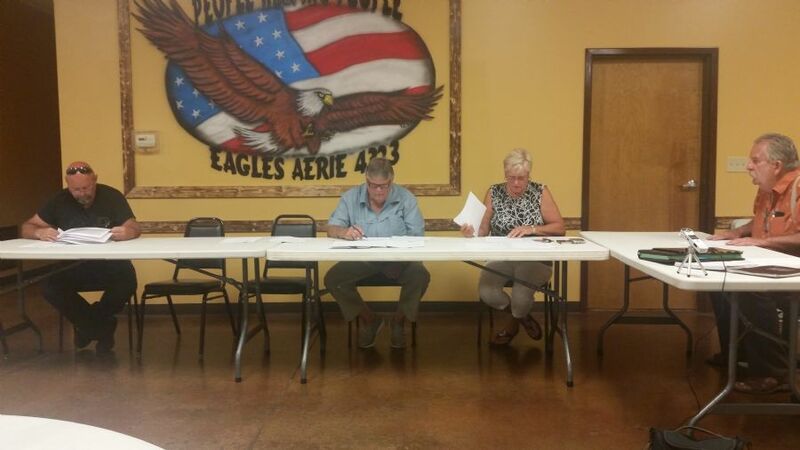 The Lapel Town Council held a regularly scheduled meeting at the Eagles on 9th St on July 19th from 7pm. The main topic of discussion was plans by the railroad to bring in four passenger cars and a locomotive by rail to be unloaded and trucked to Atlanta, Indiana. The Town Council approved the request to close 9th St from John to Woodward during the day until the project is completed. This project could take as long as a few weeks to complete and will start early August although you may see these railroad cars on a siding near the grain silo as early as Monday. Access to the Eagles will still be open. The contractor working on the project may trim some low hanging limbs on trees along 9th St and will take down the four-way flasher at 9th and Main to allow the nearly 18ft tall cargo to leave Town once it is unloaded. If any of you remember the transformer that was unloaded at the same location last year, this project is BIGGER. The Town Council approved a new employee drug policy. The Town Council voted to approve hiring the firm of Graham, Regnier, Farrer & Wilson, RC out of Elwood, Indiana to represent the Town of Lapel. Current attorney Bill Byer who has worked for the Town of Lapel since 1990 is moving on to a county position and is no longer able to represent Lapel. The new firm has agreed to charge the same rate as Byer this year, and then pay will be re-negotiated in 2019. The Town of Lapel paid Byer & Byer, $4,600 per year plus $200 per hour for any additional work. The Town Council interviewed two firms for the job and felt that Graham, Regnier, Farrer & Wilson were interested in helping the Town grow. The Town Council approved spending $16,000 (step 1) to perform a cleaning on Ford St well by Peerless Mid-west. This includes cleaning the well casing and the Pump. The Town Council also approved spending up to an additional $12,610 more in parts to repair the pump depending on the outcome of step 1. The Town Council acknowledged that there are still some issues with water supply. Complaints of discolored water are from all over town and not isolated to any location. Dennis Molina to contact Water Plant company to have them help investigate the issue. The part to fix the AC at Town Hall has been shipped and will be installed under warranty. The Town Council instructed Police Chief Kelly Naselroad to make sure seat belt laws are enforced for people riding in golf carts.